May 2016 – Girl Who Would be KING on Life, Style and INSPIRATION. You’ve invited some friends over for an informal gathering and you want to offer your guests something to soak up the wine/cocktails with (because you’re a gracious host and always put out some food be it the tasty but predictable dips, cheese and coldcuts platter)…but this time you want something a little more pleasing than the usual. Maybe a little charcuterie? Charcuterie is the perfect essential French cured meats and more. Done right, the charcuterie board is an awe-inspiring sight. There are the meats, of course, in a smorgasbord of cuts, cures, and flavors. And then there are the mustard and pickles and crusty baguettes, and the fact that we get to eat it all with our hands. In a world where fine dining typically comes with dainty cutlery and elegant plating, charcuterie speaks to a different, gloriously primal, kind of indulgence. But what exactly is French charcuterie? How does it differ from, say, the cured meats of Italy, or the bounty of smoked Delikatessen meats made in neighboring Germany? And what do experts consider the most noteworthy items under the charcuterie umbrella? The word itself comes from the French words chair, meaning “flesh,” and cuit, meaning “cooked.” It first entered the culinary lexicon in the 15th century to represent storefronts specializing in the preparation of pig and offal at a time when shop owners weren’t allowed to sell uncooked pork. 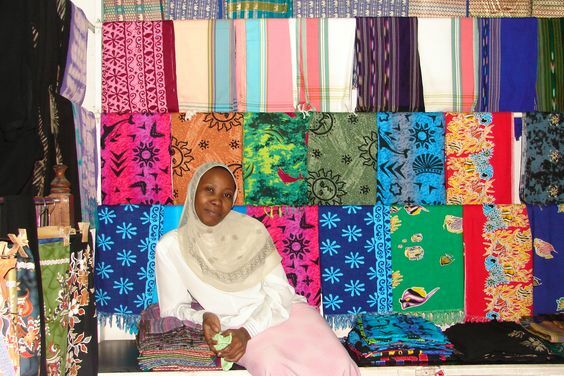 These owners,charcutiers, would hang inventory in their shop windows to draw customers in. It worked: The craft was mastered, and a culture was born. As for how it’s defined today? Elias Cairo, founder and charcutier of Oregon’s Olympia Provisions, puts it simply: “Charcuterie is value-added meat,” he says, “where something is added, be it salt or heat, to enhance flavor and prolong shelf life.” So, really, charcuterie is an exercise in crafty innovation—resulting from a need to preserve the fruits of a day’s hunt. Smoked meats and fish came first. Cured meats came second. Once processed, many products in the charcuterie canon were covered with melted fat, either butter or rendered poultry fat, to maximize stability and prevent spoilage. Then again, these methods of preservation are practiced internationally. So what makes French charcuterie so diverse and unique? “The French rely on amazing technique,” says Cairo. “But they’re so good at farming and processing, too, and have such respect for ingredients.” And, when most charcuterie items are little more than pork and a few spices, it’s crucial that each be of the highest caliber. 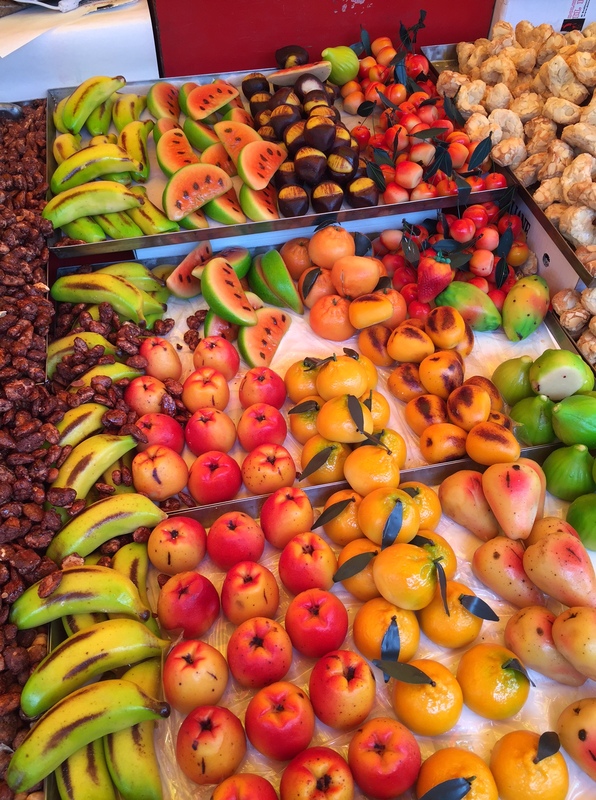 French chefs place such value not only on the end product, but [on] the entire process and where the food comes from. French charcuterie has always been shaped by regional variety as well, which contributes to its vast inventory. Each region uses its geographic strengths and uses the wealth of ingredients that are readily available in that particular area. The full list of French charcuterie items is long and not at all lean, but there are a few that experts consider classics. So let’s open a bottle of wine, break into some fresh bread, and dig in. “Pâtés and terrines, broadly speaking, are essentially big sausages cooked in some sort of mold,” Michael Ruhlman writes in Charcuterie: The Craft of Salting, Smoking, and Curing, the book he coauthored in 2005 with Brian Polcyn. Put simply, they’re a mixture of fat, meat, and seasonings that can be ground or puréed. The grind can vary from coarse to fine, and pork is the dominant pâté meat. But in the US, says Collins, “we have a broad umbrella and use the word ‘pâté’ very loosely.” She talks about her own experience in France, where the structure of definitions is less rigid. 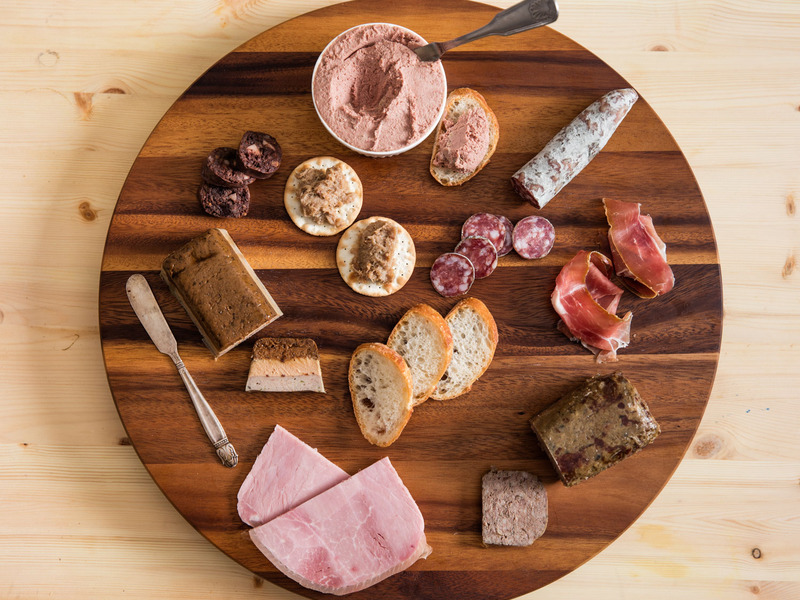 But for the American market, which is less familiar with charcuterie products, Les Trois Petits Cochons distinguishes pâtés as coarse in texture, meat-based (from mostly duck, chicken, and rabbit), hearty, and garnished with spices and, occasionally, vegetables. Pâté de campagne, the most common, is a coarse grind of lean and fatty pork with spices and little, if any, liver. More lavish versions are found baked in pastry dough (en croûte), in a mold (en terrine), or in skin (galantines and ballottines), but, historically speaking, the charcutier’s goal was always the same: “Pâté was created to use up the excess product—offal, trim, fat—from a day of slaughter,” Cairo writes in his book, Olympia Provisions, coauthored with Meredith Erickson. A typical pâté de campagne comes in the form of a savory loaf, flavored with onions, white pepper, and cognac. It’s a deeply porky product that’s simultaneously light and delicate. Mousses, like pâtés, can be made from a variety of meats. But a mousse is much more finely ground, yielding a smooth texture. 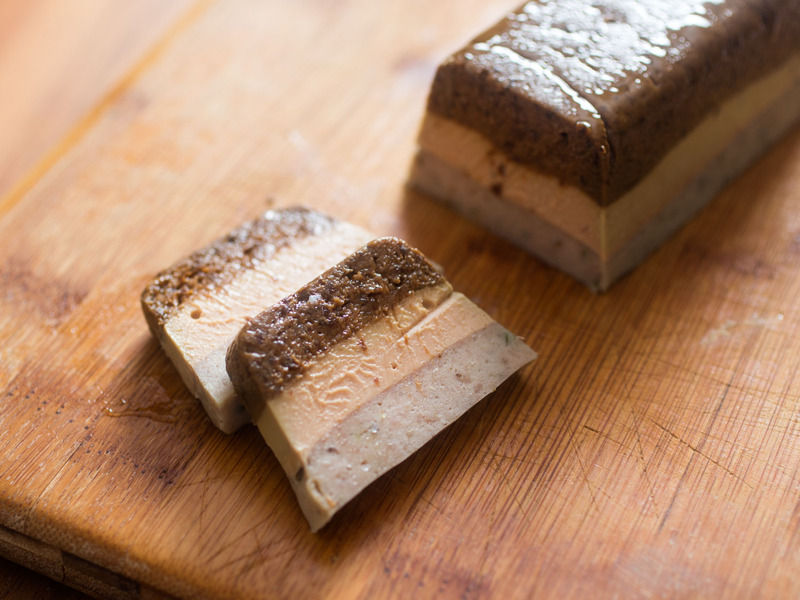 And, while you’ll find liver in both pâté and mousse, the percentage is typically much higher in mousses, which gives them their famously creamy consistency. “Pâté and mousse and all the products we make, a lot of people think of them as high-end, which is great, because we use great ingredients, and they’re labor-intensive. But pâtés and mousses are really a labor of love. They utilize items that are essentially leftovers,” says Collins. 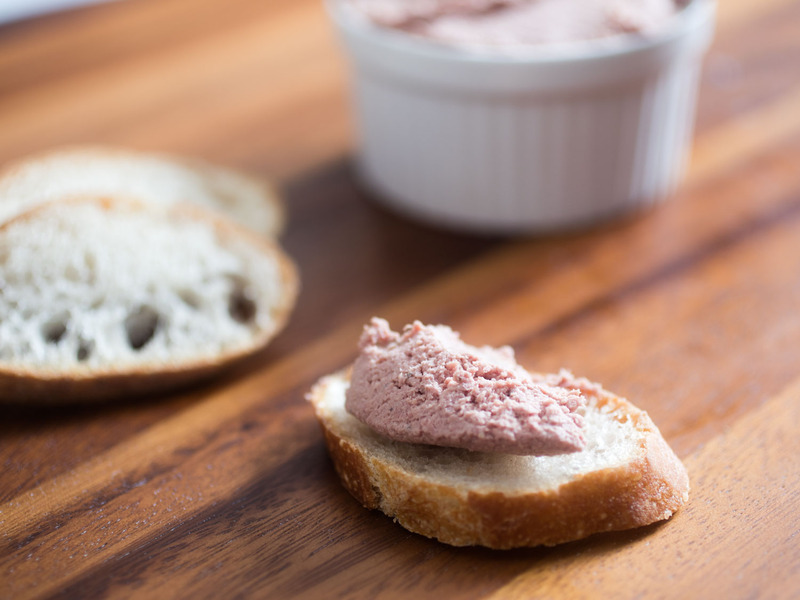 The transition from liver to mousse typically starts by soaking livers in cold water. “This will remove some of the really iron-y flavor that liver may have,” Cairo says. For his pork liver mousse, Cairo marinates livers for two days once they’ve soaked, after which they’re puréed in a food processor and passed through a fine-mesh sieve. The rich liver, enhanced with a dose of cream and egg before it’s cooked, is balanced with a splash of port. Chili flakes, white pepper, and coriander add a spiced depth to the spread. 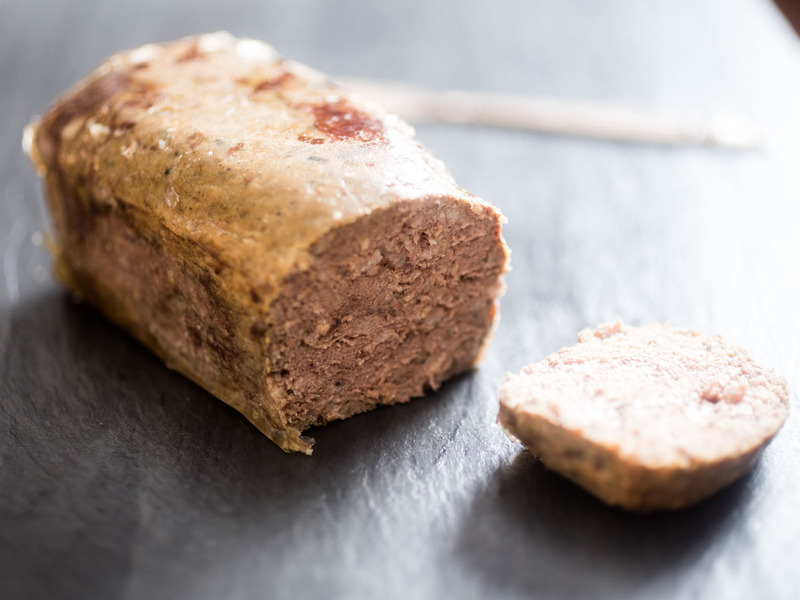 Boudin means “pudding,” but these savory sausages are made from ground, spiced meat packed in natural casings and then boiled, poached, or blanched. The two most common varieties are blanc and noir (white and black, respectively). Blanc is more of a holiday sausage, usually served around Christmastime, and often seen in Auvergne, in central France, where chestnuts are widely grown. The Fatted Calf stores in Napa and San Francisco, California, make theirs with cream, bread crumbs, and chestnuts that have been braised in broth and bourbon. 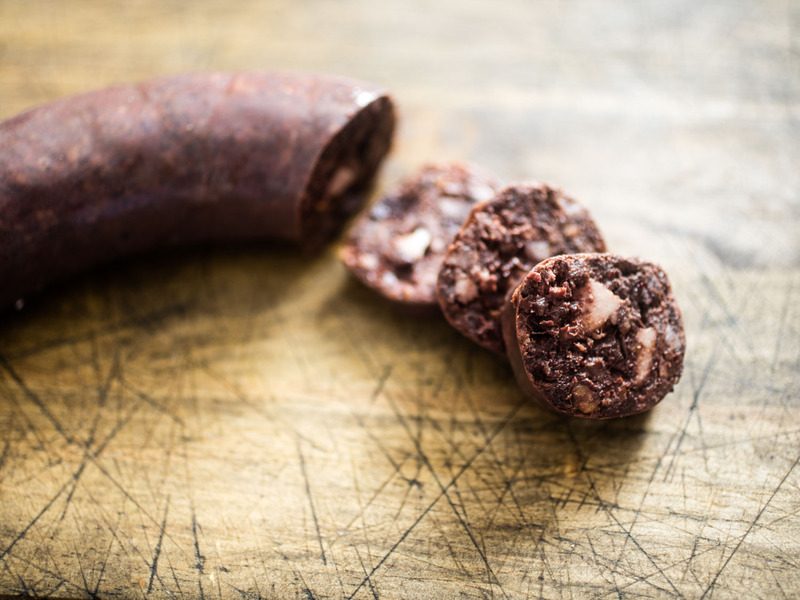 Boudin noir is named such for the addition of pig’s blood to the sausage, which gives the final product its signature deep, dark red color. “The French aren’t afraid of anything,” says Heather Bailie, an owner of Fatted Calf. “That’s where blood comes in.” Theirs, like most traditional boudin noir, is a pork product made from a mixture of shoulder, blood, diced back fat, caramelized onions, apples (when they’re in season), and a salty, smoky Basque spice called piment d’Espelette. The sausage mixture is encased, tied off at the ends, and poached in water with onion and bay leaf. The blood solidifies as it cooks, for a delicate, savory sausage with a mousse-like texture. 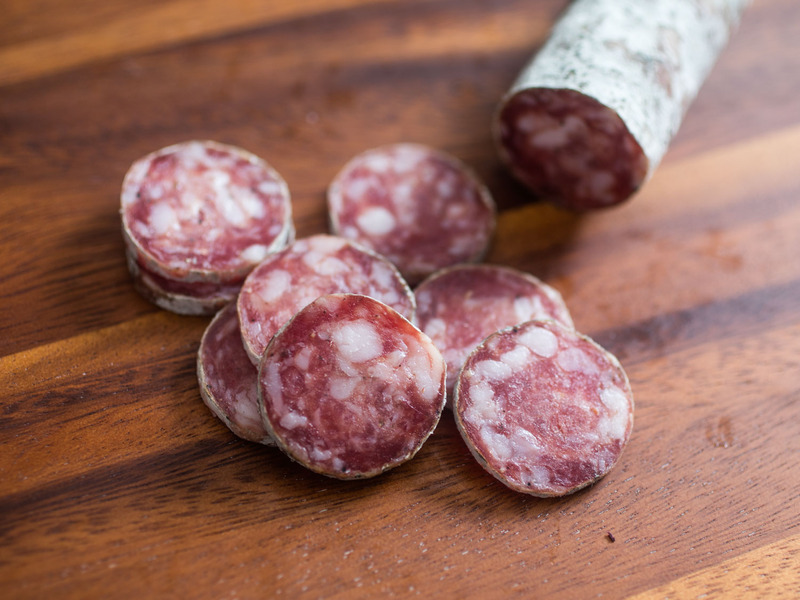 The regional variation in French charcuterie is perhaps most evident in saucisson: dry-cured, fermented salami. Dry-curing is simply preserving meat by using salt. As saucissons age, natural, healthy molds develop on the casings that prevent bad bacteria from contaminating the meat. 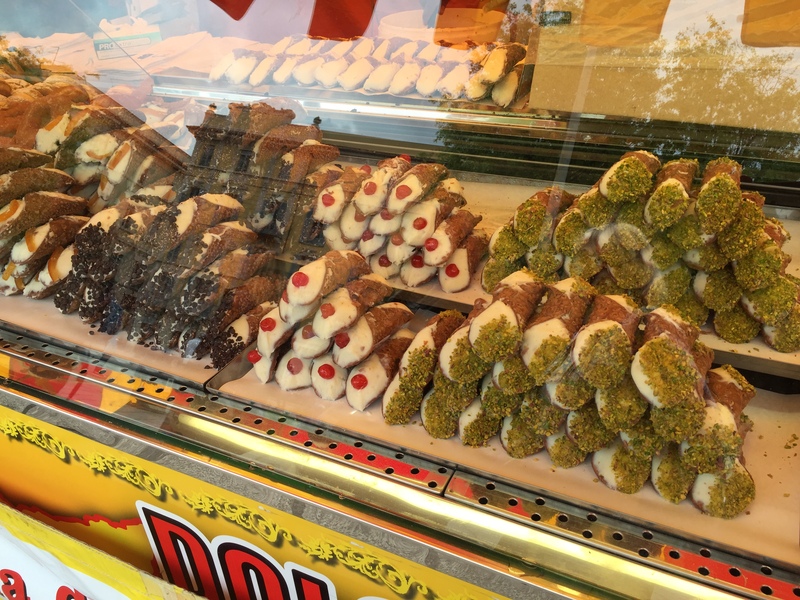 These casings can be removed, but Cairo, who makes four different, regionally inspired saucissons, encourages leaving the natural casings intact to enhance the experience. Saucisson sec (dry) is the most common of the French saucisson arsenal. “If you go to France and go to a charcuterie shop and buy a dried salame,” Cairo says, “this is the flavor profile you’re going to get.” That profile is dominated by pork, as it should be. But Cairo strikes a balance of that porcine perfection with a hint of garlic and a subtle spice from traces of black pepper, the only other two components of saucisson sec. This type of charcuterie is about simplicity and respect for ingredients. 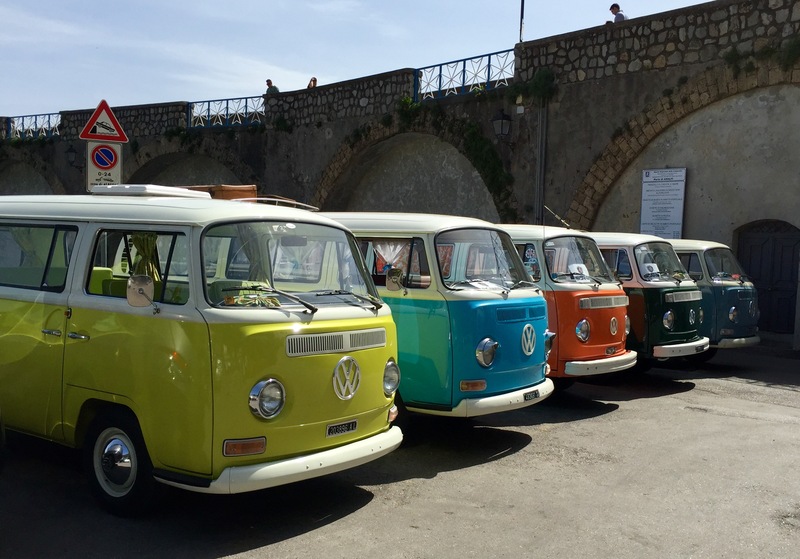 As you travel around France, though, you’ll discover many variations on the theme. In Alsace, saucisson is traditionally spiced with clove, allspice, cinnamon, and nutmeg, making a deeply savory and satisfying wintry salame. In Arles, where it is at its purest, you’ll find it made with just pork and salt. 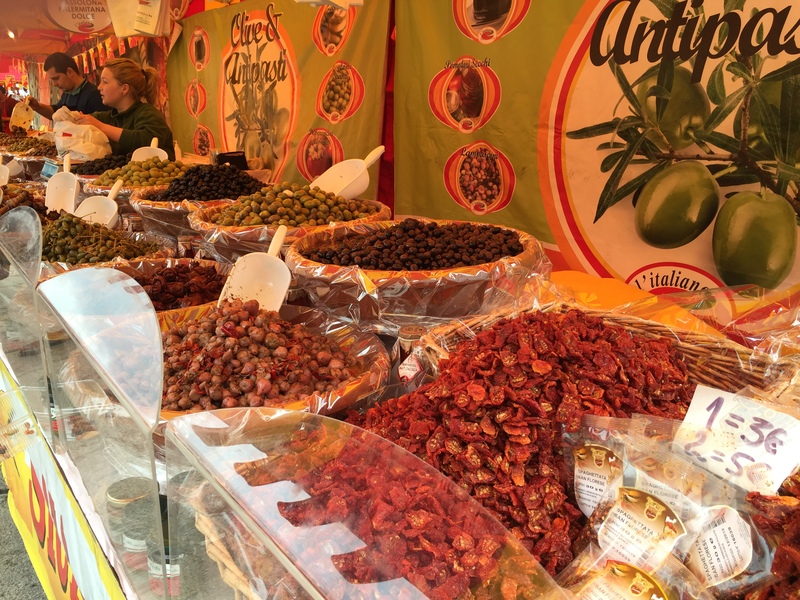 Meanwhile, eastern France, near the Swiss Alps, is famed for its saucisson aux noisettes, a salami made with pork, salt, and whole hazelnuts from Savoy. 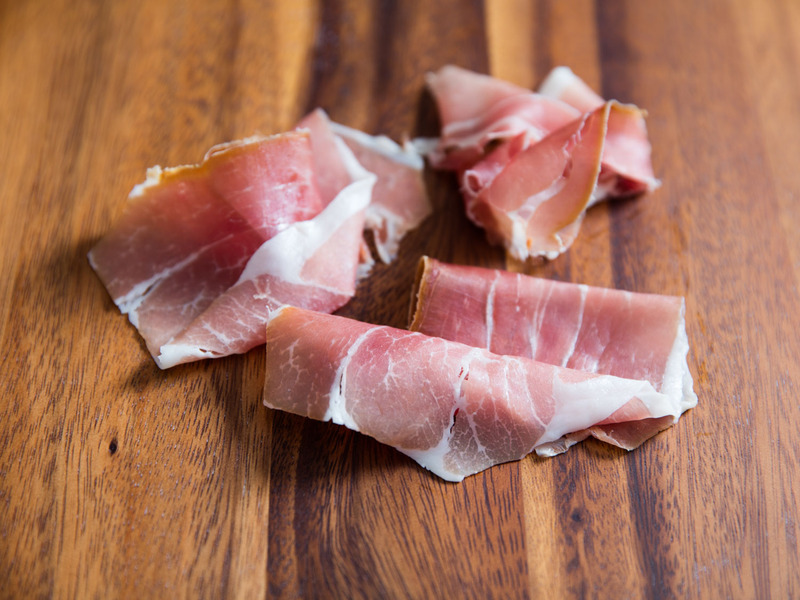 Cooked and cured hams are frequently seen in French charcuterie, but different regions are known for different types. Jambon de Paris is a three-muscle, lean, low-fat ham wrapped in its own skin and cooked in its own juices. It’s flavored with nothing but salt—with little else to distract from that flavor, it’s important that the meat be high-quality. Jambon de Paris is the perfect slicing ham, typically cut thin and served with butter on baguettes, or on croques monsieurs and croques madames. Jambon de Bayonne is the quintessential French cured ham, the country’s equivalent of Italian prosciutto di Parma or prosciutto di San Daniele. It comes from the city of Bayonne in southwest France, a city cut in two by the Adour River, which sits in the shadows of the Pyrenees Mountains. Jambon de Bayonne is a regionally protected foodstuff under PGI (protected geographical indication)—a designation that covers goods whose production, processing, or preparation takes place in a specific area. To qualify, the ham must be cured with salt from the Adour River basin only. This, along with USDA restrictions on the number of foreign meats allowed for import, is part of the reason Bayonne ham wasn’t spotted on American shores until spring of last year. Thinly sliced, a piece of Bayonne ham tastes like a cool glass of clean river water. It’s slightly salty, evidence of the Adour River’s proximity to the Atlantic Ocean, and then sweet from traces of pork fat that melt on your tongue. It’s still difficult to find in the States, so your best bet is a specialty meat and cheese shop. The minimum age for a jambon de Bayonne is only seven months, but a longer cure will give it a more intricate and nuanced flavor—the 12-month ham sold at Murray’s Cheese is something truly special. Though rillettes can be made from meat simmered in stock, the most traditional iteration starts as confit—meat that’s been heavily salted and then cooked in its own fat. But where confit is presented whole, rillettes call for finely shredding or chopping the cooked meat and then folding it back into that fat. From there, the rillettes are packed into a small container, making them less unwieldy than an entire confited duck leg, and topped with a final layer of fat, which keeps air out and extends shelf life. Pork is considered the standard choice for rillettes due to its relative affordability, but duck and rabbit are often used as well. 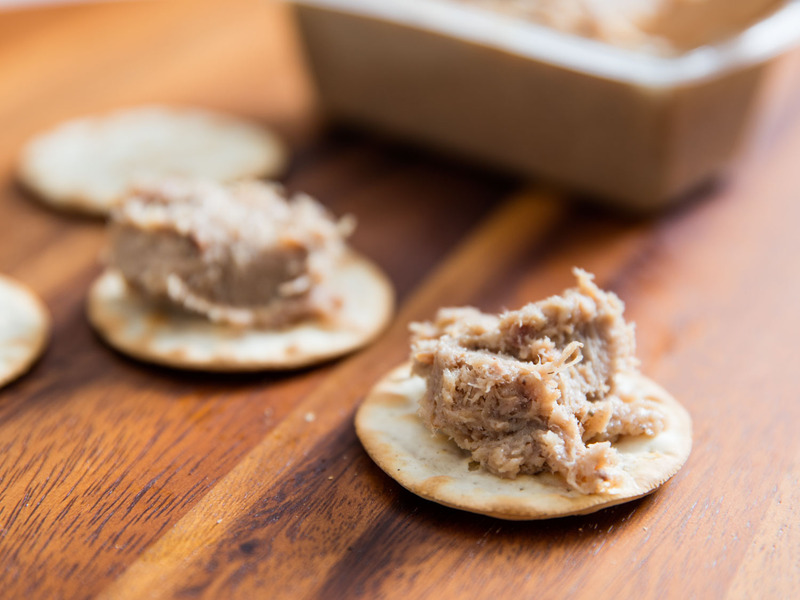 An amazing rillettes will be spreadable, soft, and rich, with a slight chew from the lightly seasoned meat. So there you have it. I found it interesting to read the history of how the charcuterie is prepared. Then having said that, maybe it’s better off not knowing too much. I’m the girl who does not eat Foie Gras but loved Boudin (which I first discovered and tried in New Orleans) before knowing some of it comes with pig’s blood added to it. Ewww. Craig Cavallo has been working and eating in New York City restaurants for a decade. 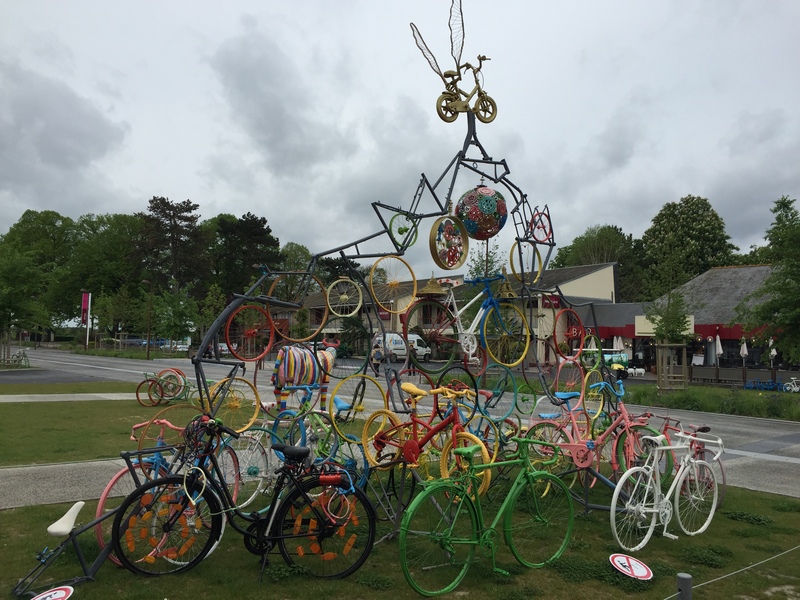 His insatiable appetite (and bike) take him from one delicious thing to the next. You can follow Craig’s journey @digestny and on Digest NY, a website he launched in 2012 to share his love of food and the stories told through it. A love affair with wine grew organically when Craig was an opening staff member at Eataly’s wine store. 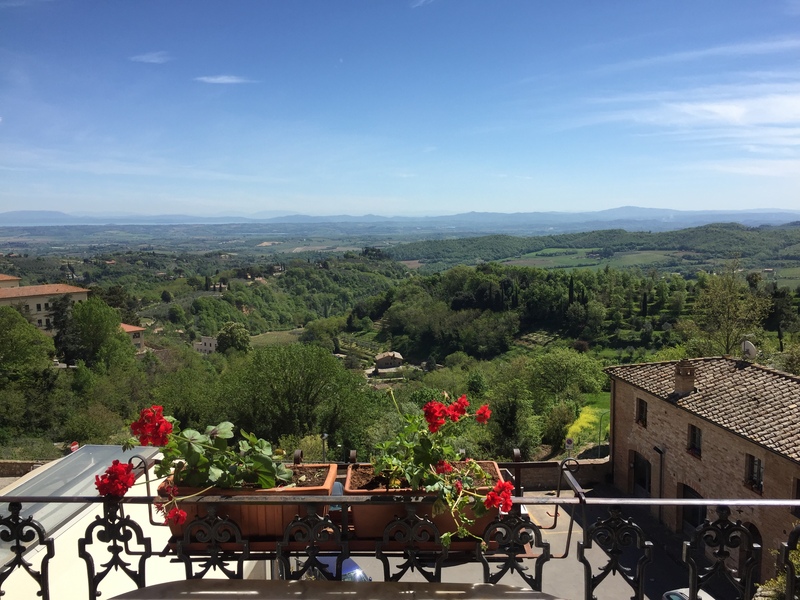 The job lead him to Piedmont where he discovered even more joys. Craig’s from Syracuse, but he lives and writes in Brooklyn. An Inspiring morning of Fun, Fitness, Flowers & Friends. 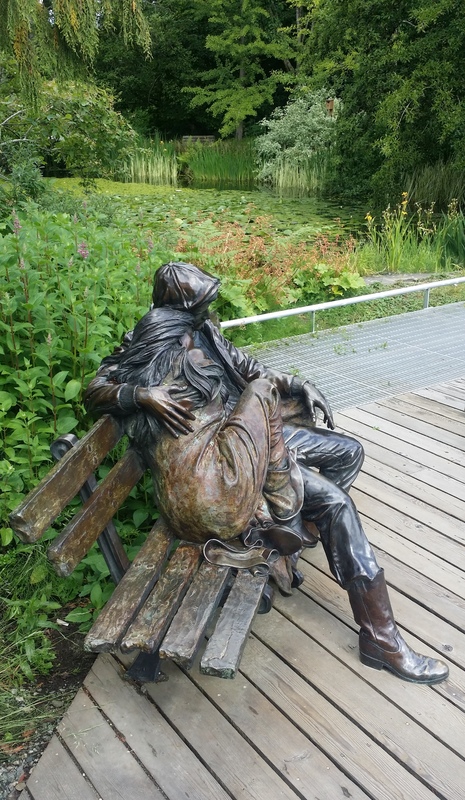 You can’t ask for much more than raising awareness for a good cause while getting exercise in fresh air in an unbelievably elegant, artful environment. 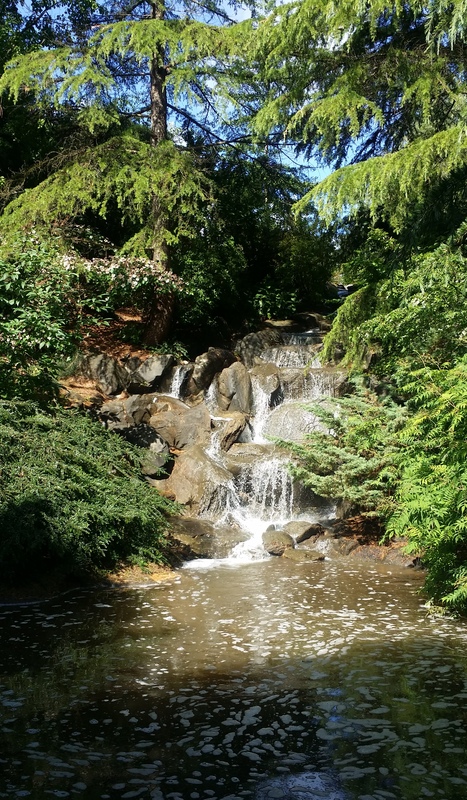 That’s what happened yesterday morning when I met up with friends at Vancouver’s magnificent VanDusen Botanical Gardens to support our mutual good friend Colleen Kohse. Colleen is the oldest living person (with the youngest spirit) with CF in all of Canada to have received a transplant. Colleen is a miracle and a true inspiration to everyone because she doesn’t take life for granted. She’s lost too many friends and two young siblings to this fatal genetic disease which primarily affects the lungs and digestive system in mostly young adults and children of which there is no cure. Come this October it will be 28 years that I first met Colleen, just before she left for London, England to receive a heart/lung transplant. But we didn’t get to really know each other until after that. We’ve been friends for years and have travelled together to places like Jamaica, Havana, Florida, Savannah, Ga, Charleston, S.C., New Orleans, California and even a short Caribbean cruise out of Miami. Always fun. Colleen is lucky to have the most wonderful, supportive family. 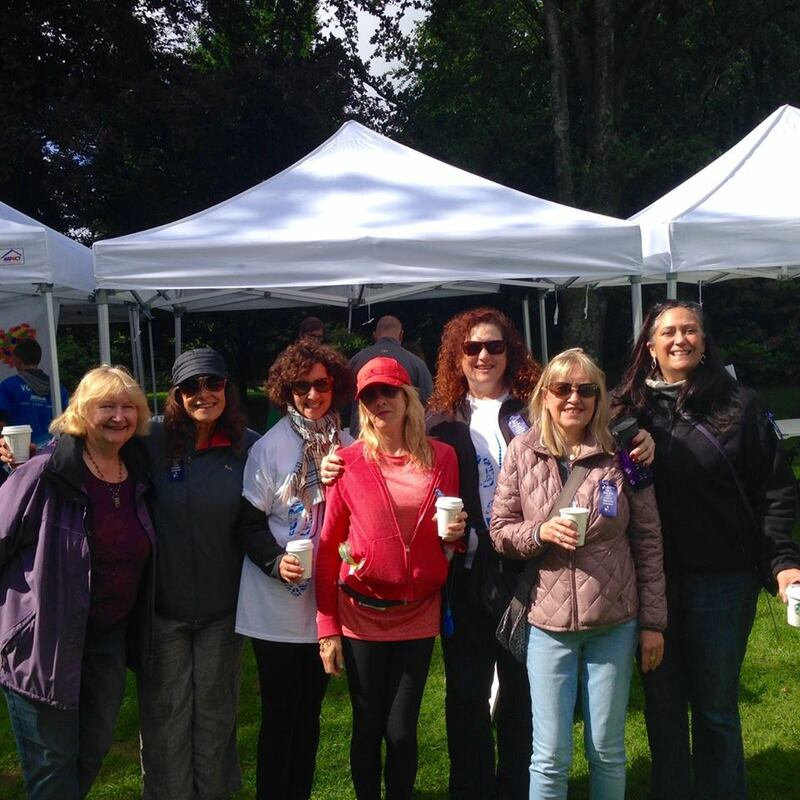 The morning started with a breakfast of pancakes & sausages, then dancing to warm up the crowd followed by a very pleasant walk through the most exquisite park to raise money to help find a cure for CF. There were also fun great silent auction items. I ended up with 2 out of the 3 items that I placed bids on. 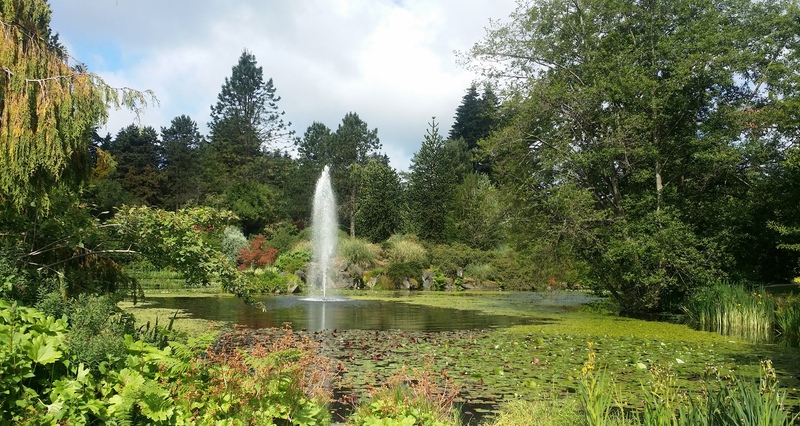 You will be inspired by 22 hectares of well-designed landscapes with plant species representing ecosystems ranging from the Himalayas to the Mediterranean, from Louisiana swamps to the Pacific Northwest. Vancouver’s mild climate makes it possible for plants to bloom year-round – so there is always something wonderful to see. Our climate creates a unique environment where plants from varying climates thrive. 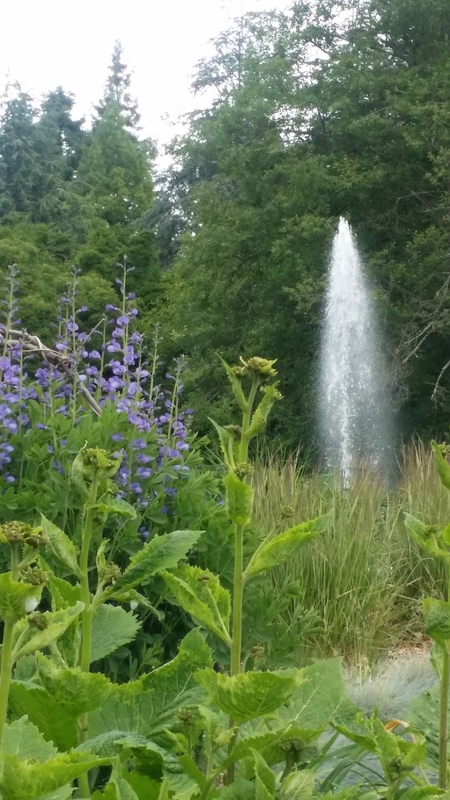 At VanDusen you will see plants from the southern hemisphere, tropical areas and the high Arctic tundra alongside native species. 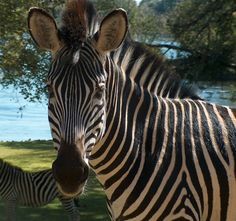 Seasonal highlights include: Spring — bulbs, cherry trees, azaleas and rhododendrons; Late Spring — Laburnum Walk and roses; Summer — annuals, perennials and water lilies; Late Summer – wild flower meadow and the Heirloom Vegetable Garden; Autumn – brilliant autumn colour, heathers, perennials; Winter — witchhazels, viburnums and hellebores. 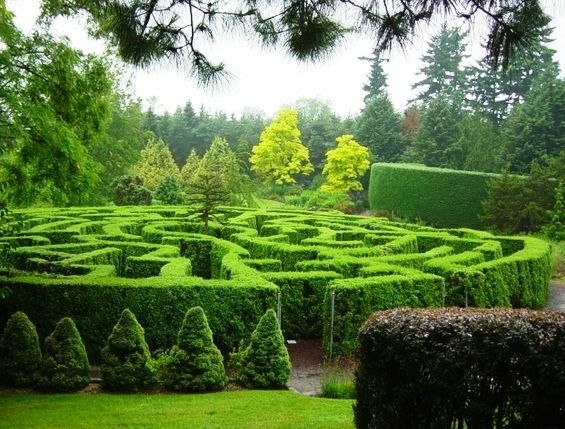 The Elizabethan Maze is one of only six in North America. 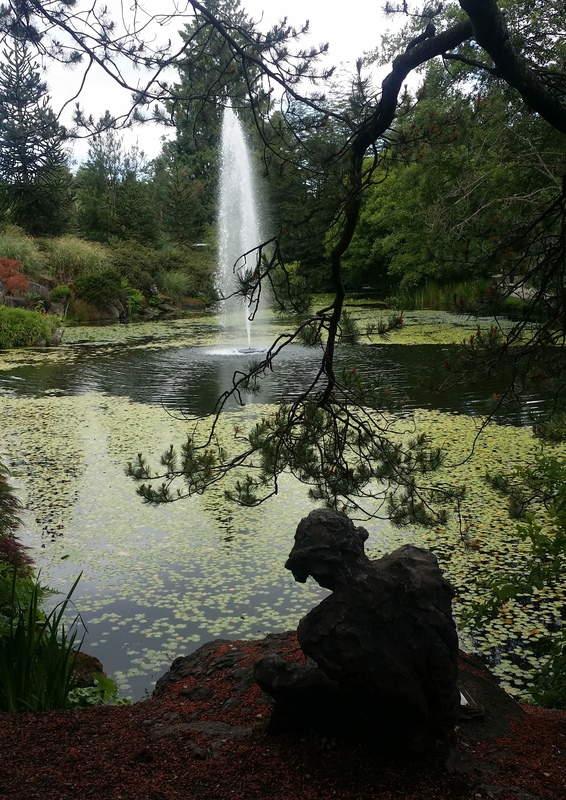 In addition to the plant collections, VanDusen’s eco-sphere is home to numerous fauna – small mammals, fish, amphibians, reptiles and insects. During the course of the year 65 species of birds make the Garden their home, either permanently or as a respite on their annual migrations. It’s a must-see if you plan to visit Vancouver. 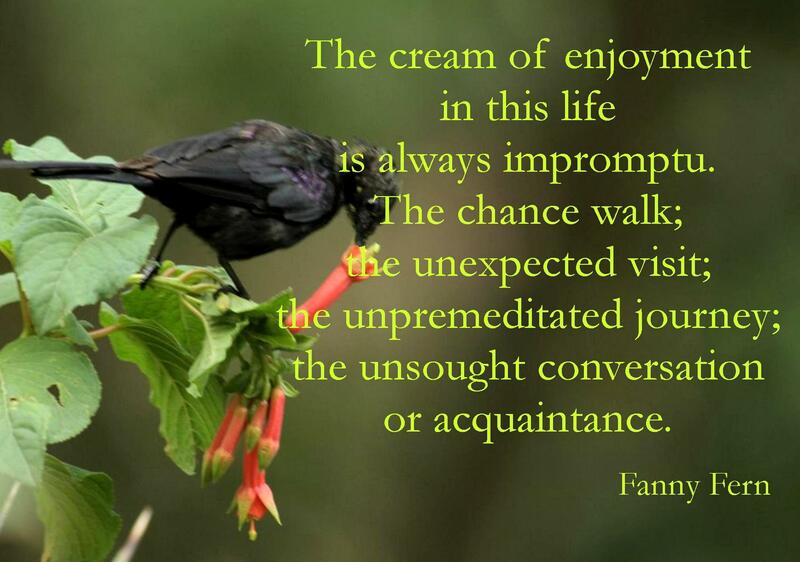 When you live with an open heart, expect joyful things to happen. 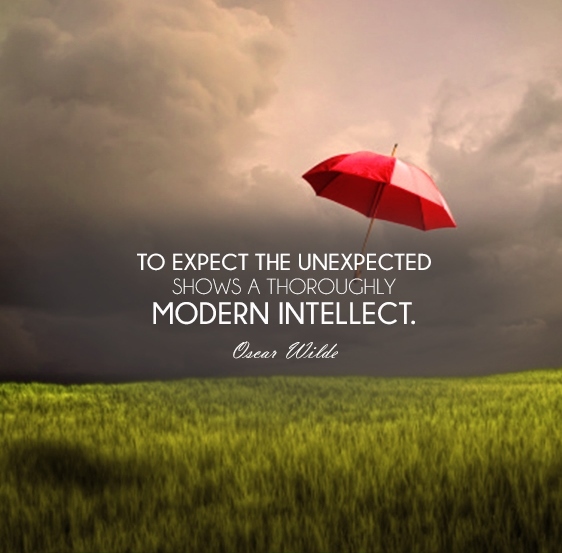 Life is full of surprises and everybody has a story. I have a knack for meeting some interesting and unusual people but the one common denominator is that they all have something to teach me. 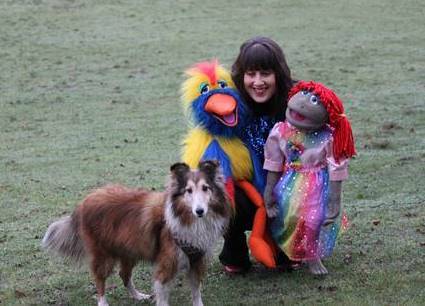 Like the time I walked Jia Jia on his 13th birthday (February 14th, 2016) and literally from out of nowhere we met this fun girl Kellie with her two puppet friends and a photographer who was trying to capture shots for Kellie’s new album cover. They expressed interested in using Jia Jia for the cover (as of course, he’s model cover material) and the puppets started talking to him on their own. Kellie didn’t say a word. We were mesmerized! It definitely added some magic to the day and made it an extra special birthday for Jia Jia. And it reminded me of living at home when my brother and I played with a human-like ventriloquist puppet that we would talk to…but it never spoke back. And it went to prove that my dolls really did speak to me when I was a child. Kellie’s new CD is called The Story of Me, Myself & I. The theme of my album is about turning challenges into successes. I wanted to get across the idea that it’s okay for children and youth to go through challenges. You can get through hard times but you must never give up, and I wanted to talk about this through music. The songs on this album also connect to when I was growing up on our farm. I had a lot of energy as a child and would often be found climbing up door frames, jumping from trees or daydreaming. If I was worried I would get outside into nature and just ‘be.’ My dad taught us to plant trees every year to give back to the farm. 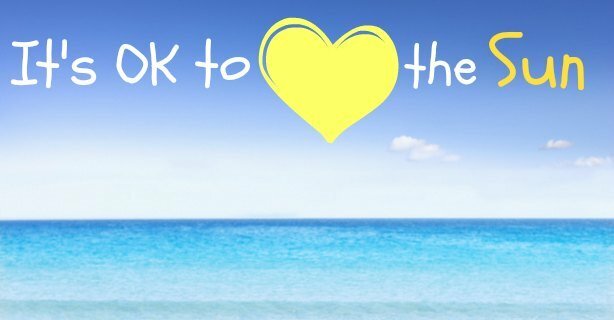 My mom and dad would walk with us three kids and talk to us about our feelings and how we were doing at school. The farm was a refuge for me and a place for me to develop my talents. After a hard day at play Jack blends in with an outdoor throw. Green as it so happens, is his favourite colour. 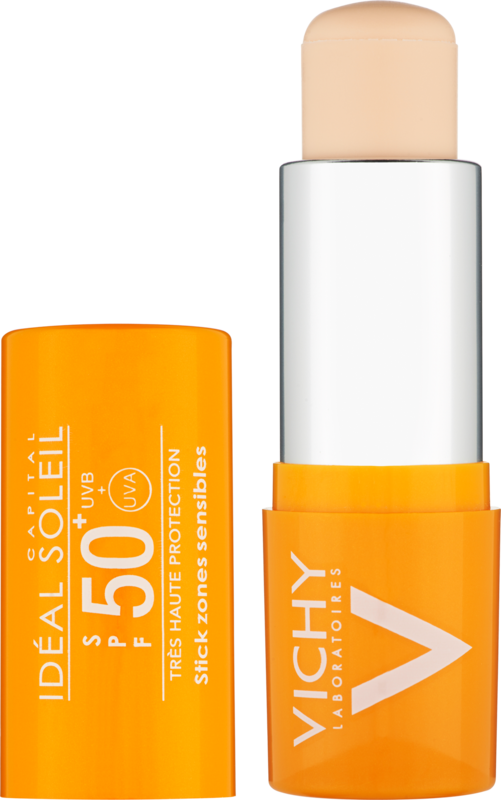 A travel friendly, drugstore available, stick in your purse sunstick with high SPF to use before heading out the door and for touchups throughout the day. 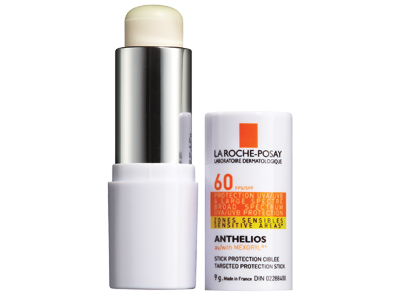 We know we need to protect ourselves from the burn but truth be told we don’t want to gain any more sunspots or lines on our face or body. The stick appears to be a good solution because they’re small enough to carry around and don’t spill. Both these companies are reputable. There are others, but I prefer these two brands for sun protection. Also, it’s so light you can hardly feel it. It doesn’t replace my usual tinted moisturizer for face with SPF 60 but it’s great for use around the eye & high cheekbone area specifically. It will become my new staple. My newfound love for light comfort with a hint of cool. 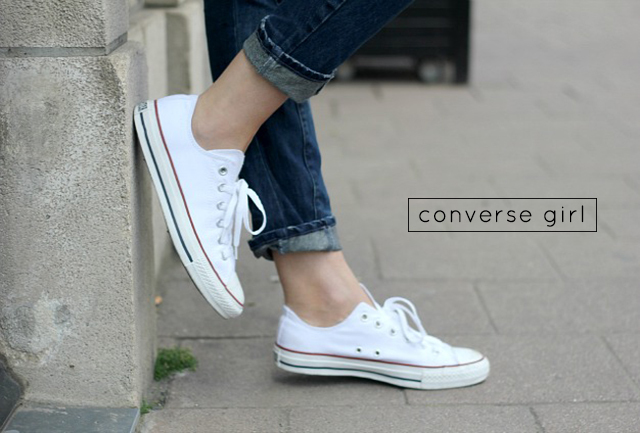 White Sneakers are making a comeback…again. 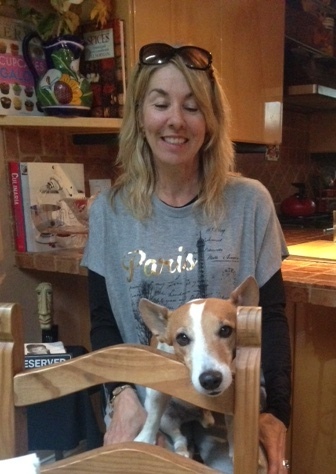 Something to slip into while walking the dog, getting groceries, out for coffee, walking to work, (walking to work is on the rise with the migration to urban living) or performing a concert (a la Kanye West)….to be worn with a variety of looks as you can see from these photos. Then it makes putting on a pair of heels more special for dinner or an evening out. They’re just an easy alternative to regular flats to go with almost anything. Do you have a style you prefer? For when you desire a light, easy to digest delicious dinner, try making something with fresh white fish like Halibut or Dover Sole. Both mild fish adapt really well to almost any seasoning, even something so simple and classic like butter, garlic, squeezed lemon & parsley. It’s no fuss and fairly fast to make. Sole is not a dense fish so it tends to fall apart quite easily. For me the best way to cook sole is quickly in a frypan with a light breading and a little butter. I mix panko breadcrumbs with fresh grated parmesan and add spices like Italian seasoning then squeeze fresh lemon juice over top. A little chopped red chili pepper adds an extra kick. (sautéed in a little butter by itself). Sides: steamed carrots and wild rice. Halibut can be steamed, baked or broiled but never fried. Okay, I’ve never tried frying it. I just don’t think it would lend itself well to the frypan. 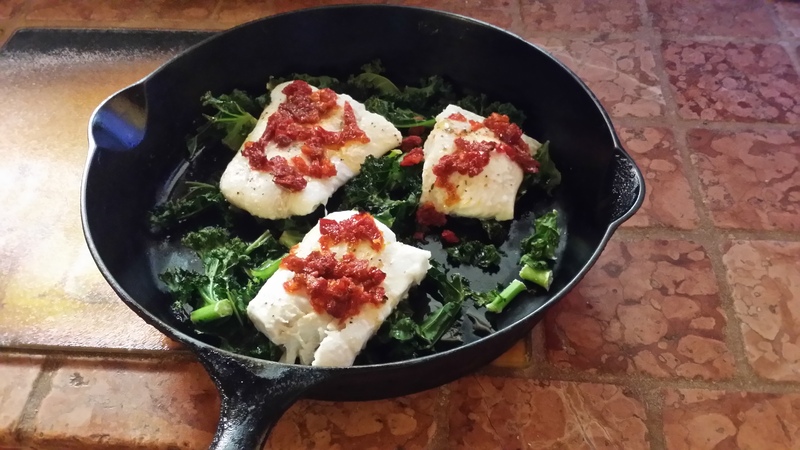 This time I placed Halibut fillets over fresh Kale in a cast iron pan and baked it with sundried tomatoes and lemon olive oil over top. 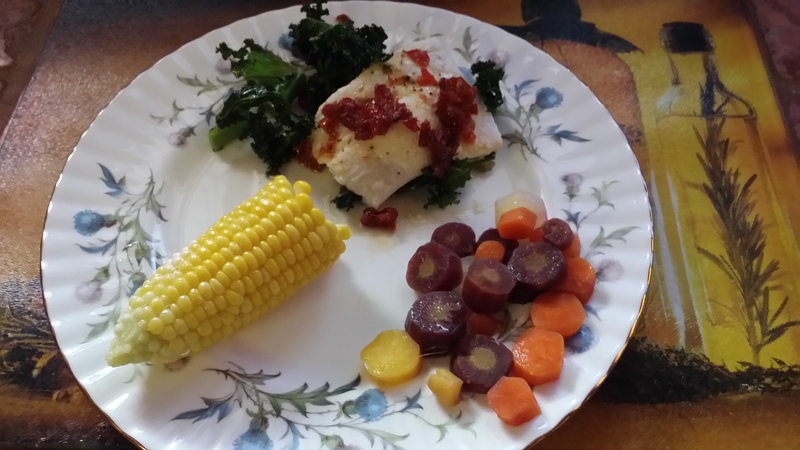 It came out moist and the kale had some crispiness – a nice combo with corn on the cob and steamed tri-coloured carrots. We’re repeatedly told to eat two fish meals per week. Fish offers a good source of protein, vitamins and minerals, low in cholesterol-raising saturated fat. Don’t forget we get major sources of two of the essential omega-3 fatty acids. But some fish contain higher levels than others. Even though sole is not usually found at the top of the list, it turns out to be a good source, according to the U.S. Department of Agriculture. It’s also packed with protein, vitamin B-12 and vitamin D. It’s also much lower in fat. Along with the omega-3s, one serving of sole only has 73 calories yet supplies 13 grams of protein, 20 percent of your RDA of vitamin D and 41 percent of your RDA for vitamin B-12. Halibut does not have the highest levels of omega-3 fatty acids in the seafood world, but it is still a good choice, containing .9 g per 100 g of fresh fish. This compares with fresh salmon at 1.4 g per 100 g of fish; lake trout, with 1.6 g; sardines, with 1.7 g; herring, with 1.7 g; and mackerel, with 2.2 g, according to weight-loss adviser Anne Collins from LiveStrong. *Sidenote: I have one helluva Halibut story. Our VW camper broke down in a tiny fishing village in Newfoundland on a Friday night moments after buying a fresh huge (emphasis on one big f…..fish) halibut right off a boat. We ended up having to spend the whole weekend in a motel that luckily had a kitchenette while waiting for a part to arrive on Monday and with me having to cook halibut every which way for several days. I’m surprised I can still eat it. Add to the misery the closest walking distance store from the hotel was a Walmart. That was the first time I set foot in one of those. They really do have a lot of stuff. Moving along right…. I have bigger fish to fry. What is your favourite fish to make? I’ve been meaning to do a travel post since my last holiday but it’s been so crazy lately that I ended up having to hire a friend to go around Italy to capture some nice shots for this post. Well that’s not exactly true. 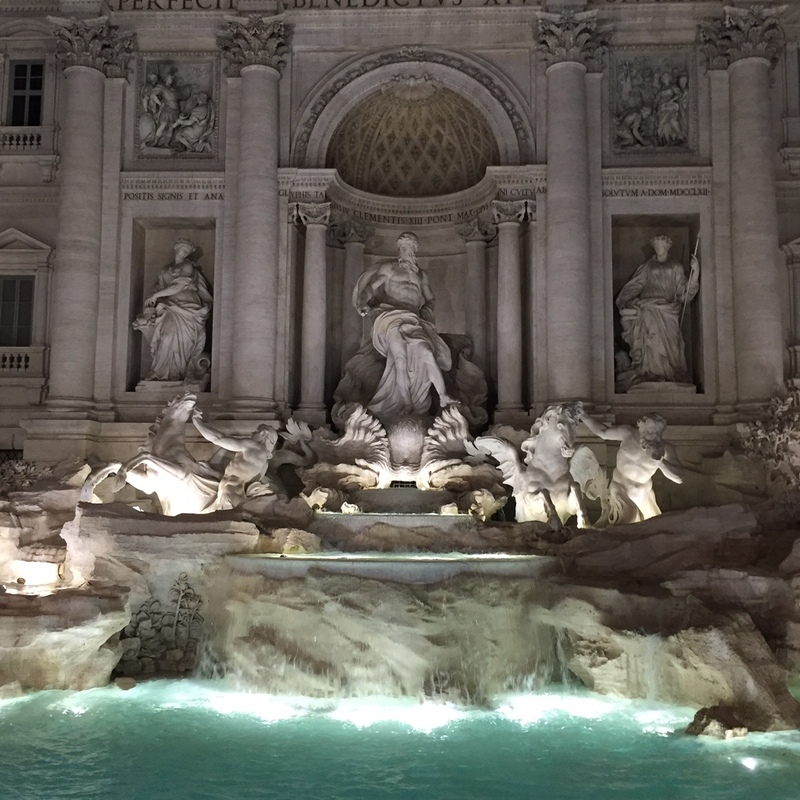 It’s just that a friend got to go to places in Italy that I’ve not yet been to and took some remarkable photos and of course she had the most amazing time. 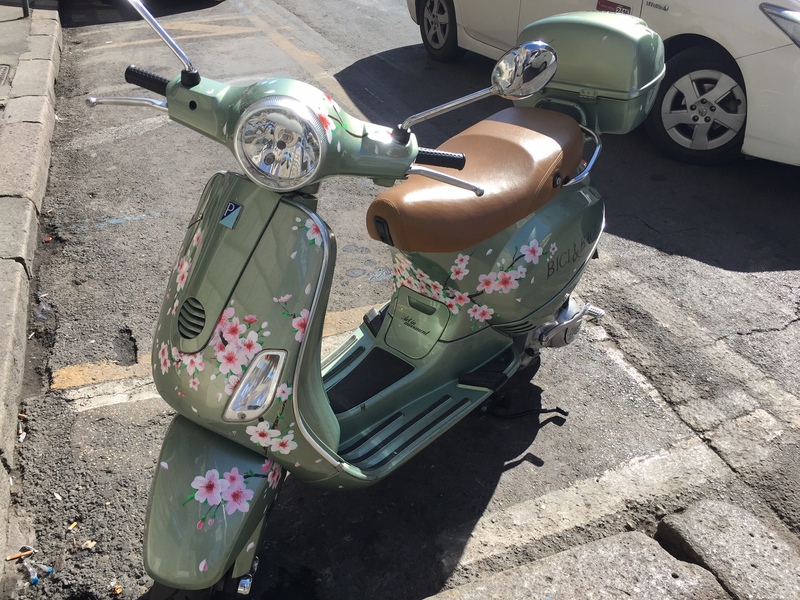 Because as she puts it “when you need a ‘spiritual’ lift, there’s no better place than the sights and delights of Italy!” So much history, so much art, so much fashion, so much food, so much style, so much…….everything. I agree. 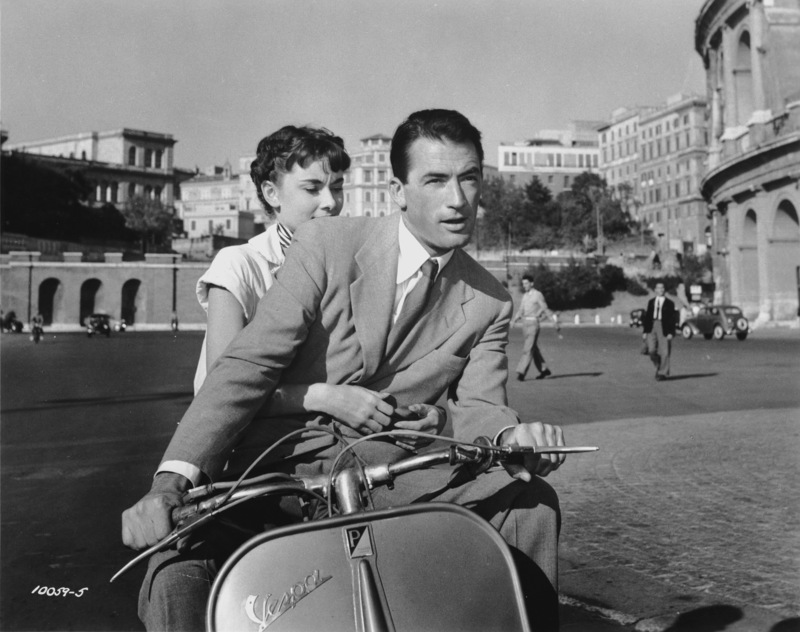 Twice I’ve been to Italy but never made it to Rome. Crazy, right? 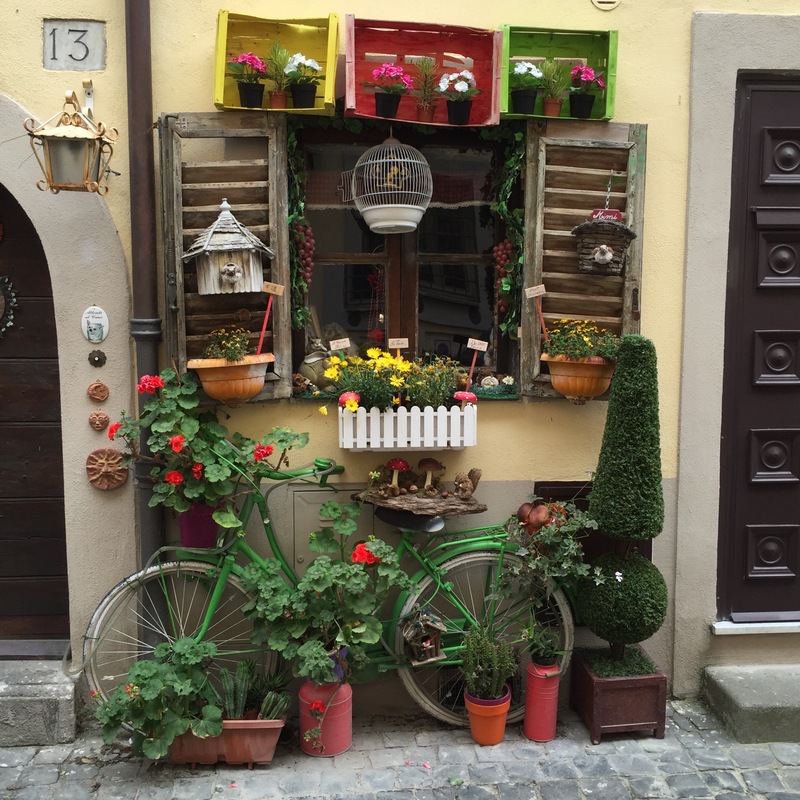 I’ve seen Milan, Venice and almost every quaint little corner of Tuscany including Florence. 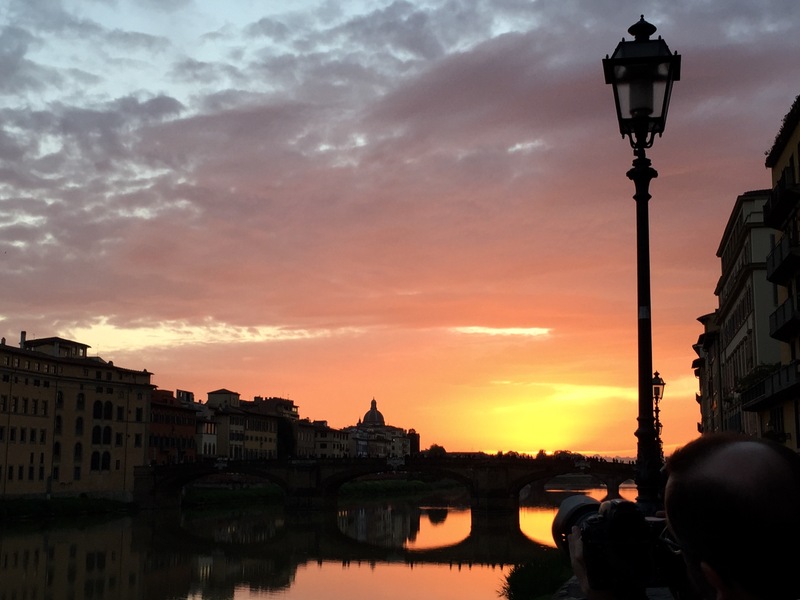 On my second visit I had to make a choice for a little side trip either to Rome or to Florence. Because of my timing situation I chose Florence. 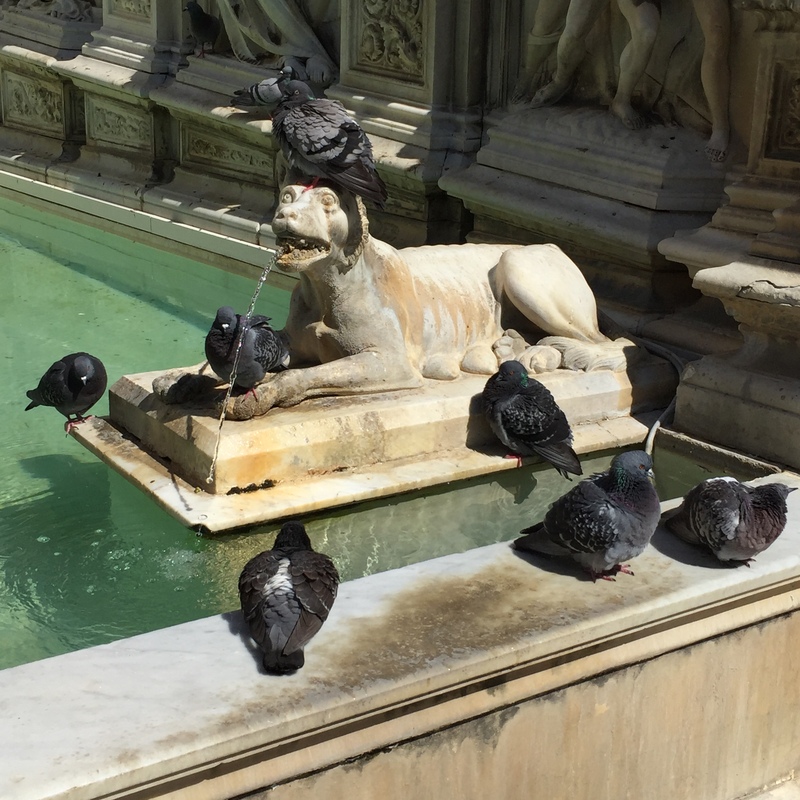 Florence is smaller, there’s lots of fabulous famous art everywhere and it’s such a beautiful, walkable city. 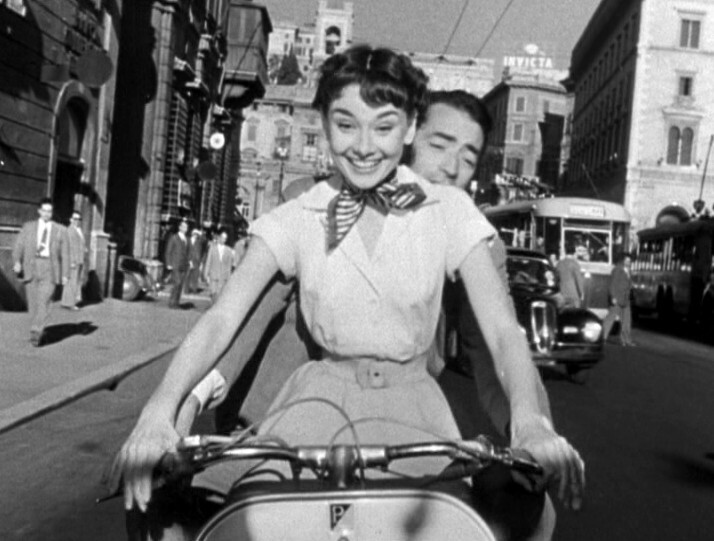 I need to make a separate trip to Rome. 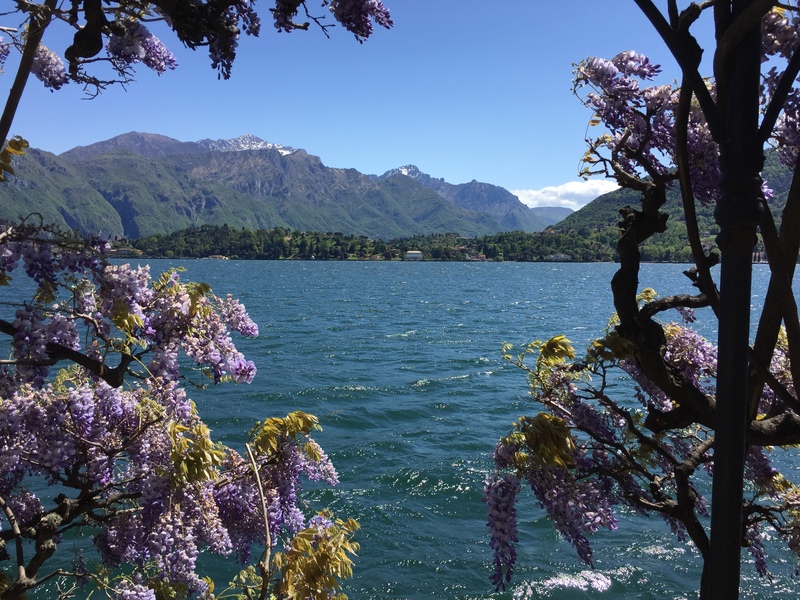 And then I need to go to Lake Como and Capri. Sooooooon! 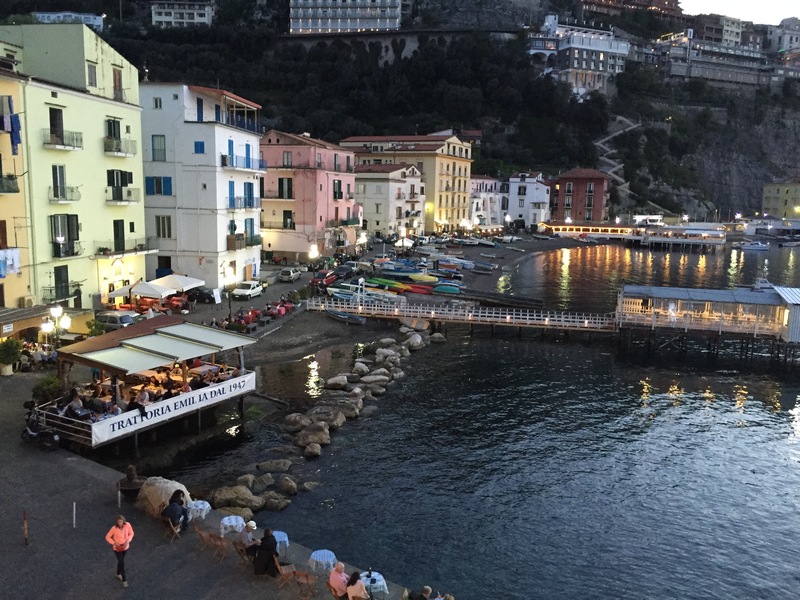 These pictures will whet your appetite for your next viaggio molto bella. 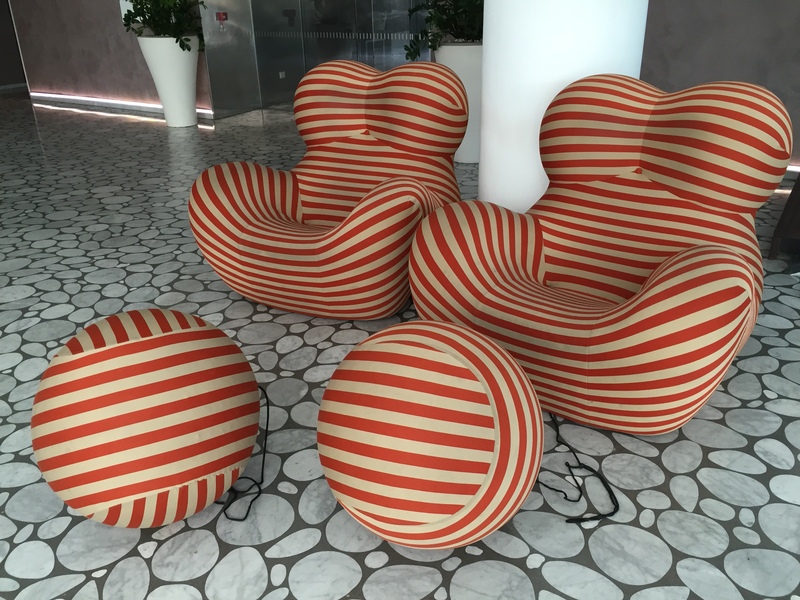 Colleen’s impression: It’s all about colour in Italy. 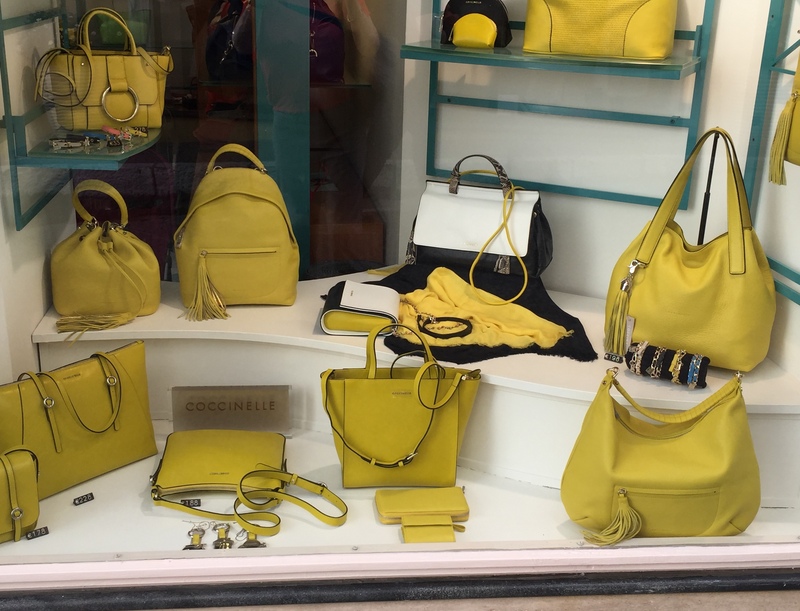 From pastels to brights, the shops are springing up in splendid colours. Now that summer is around the corner we should embrace all the colours of the rainbow. 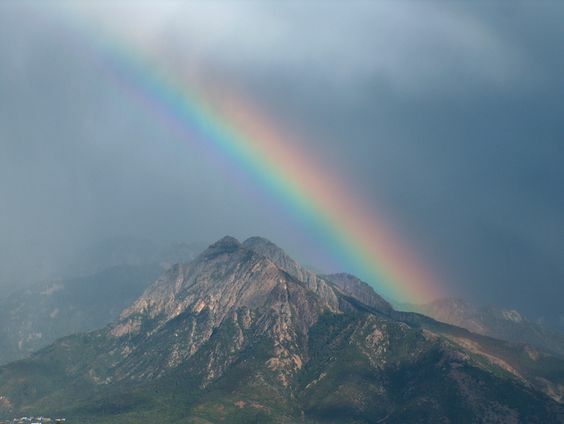 taken from a closed car window – Salt Lake City, Utah. 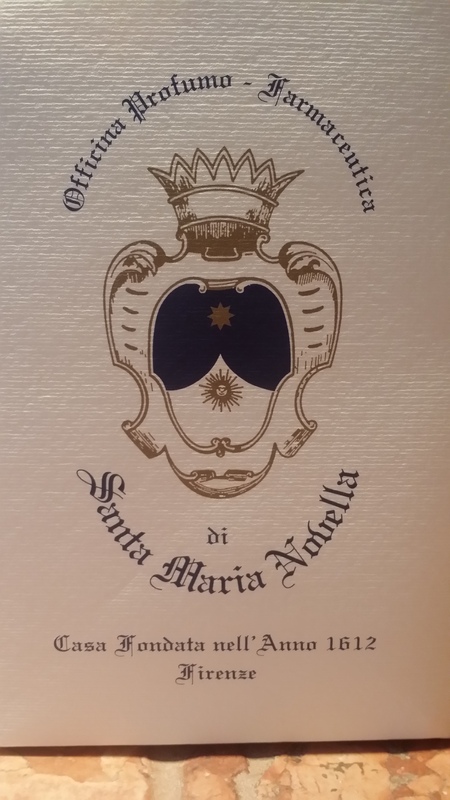 Santa Maria Novella, Florence – one of the oldest pharmacies in the world! They carry products with a meaning. They come with tradition and history which in my books makes them extra special. 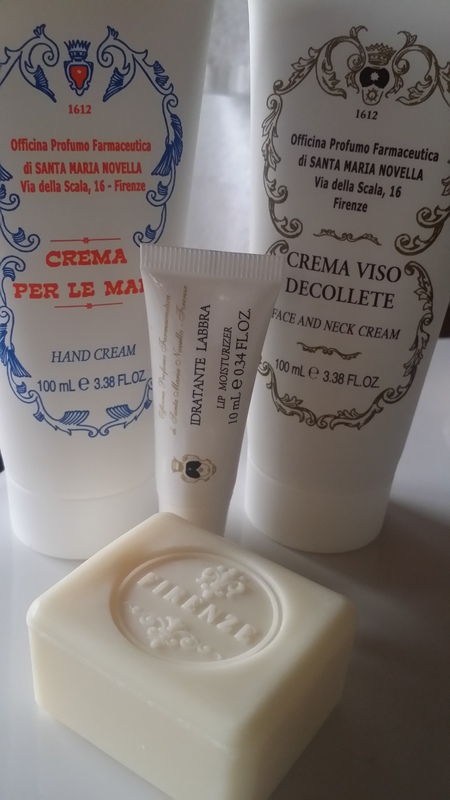 In all fairness I didn’t know about this until my good friend came back from Florence and gifted me with an elegantly wrapped package of what appeared to be some amazing skincare…made in Italy. I could tell right away these were exceptional from the tasteful ribboned box they came in and even the bag. Of course I couldn’t wait to open it up and try them. 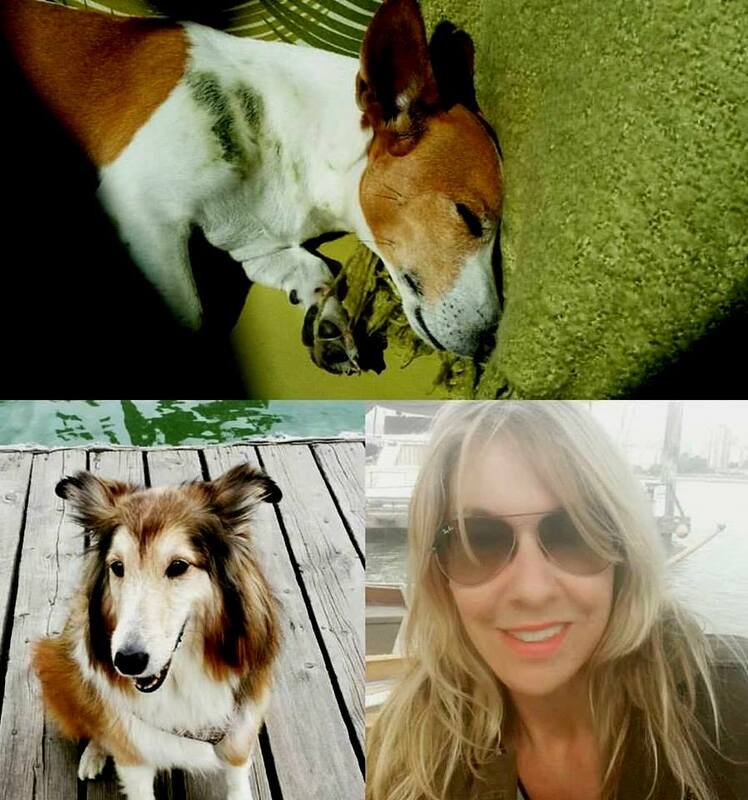 And the best part is their story (I love a good story)…. 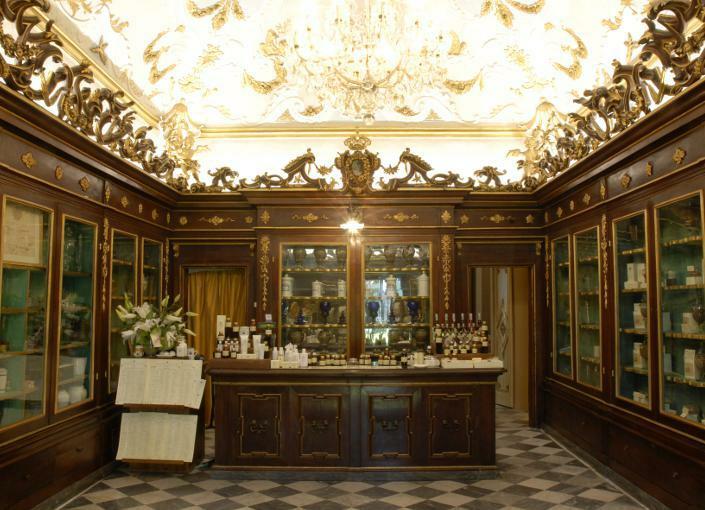 The long name is Officina Profumo Farmaceutica di Santa Maria Novella. 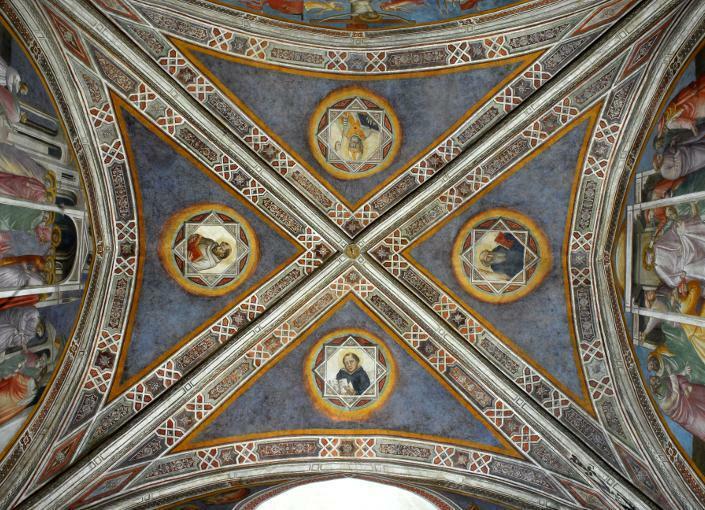 It was established in 1221 by Dominican Monks shortly after their arrival in Florence. The friars began cultivating medicinal herbs in their gardens to prepare medications, balms and ointments for their convent’s small infirmary. Once fame of their extraordinary products spread beyond Italy, it became opportune, in 1612, to open the pharmacy to the public. The ingenuity of the formulas developed by the apothecary fathers, in the 18th century became renowned and crossed numerous borders reaching Russia, the Indies, and as far away as China. Today the tradition is perpetuated and renewed. They use the highest quality natural raw materials and follow the artisanal procedures first established by the Dominican fathers. 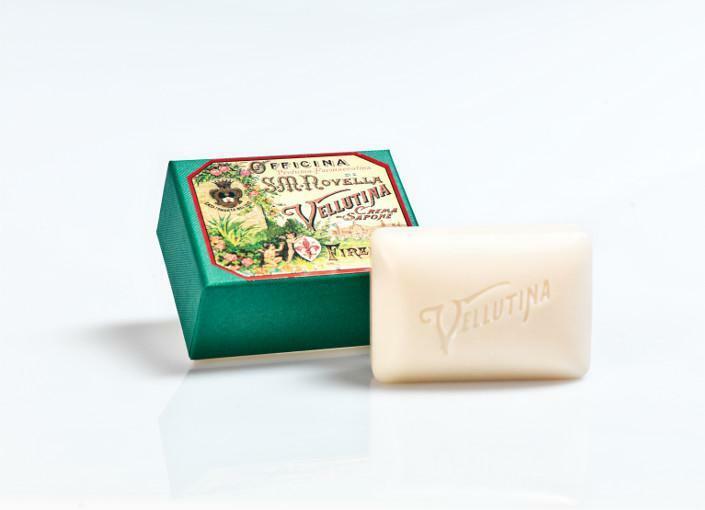 The Officina is particularly attentive to the herbalist’s art which has triumphed since the enterprise began, basing all its preparations on herbs and natural lipids, with nothing tested on animals. Each of the products has its own peculiar history. 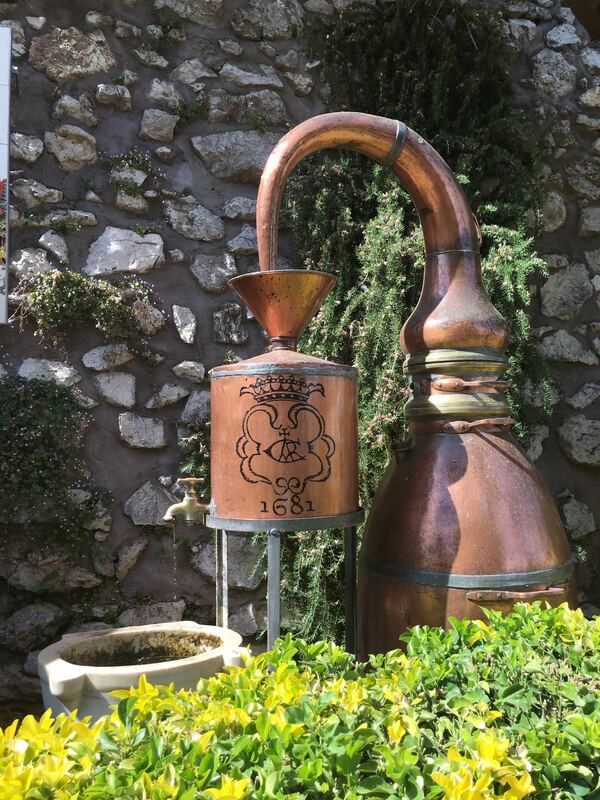 For instance one of the products “Acqua della Regina” is an essence that was created especially for Caterina de’ Medici (a noblewoman, crowned Queen of France after marrying Henry II). 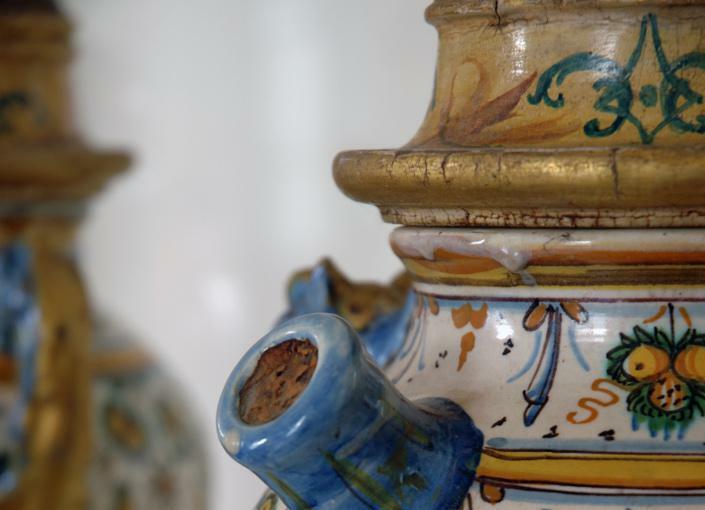 There are other ancient recipes that deserve mention but perhaps that is the most popular perfume. 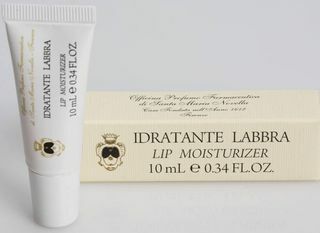 The products are available in Florence. 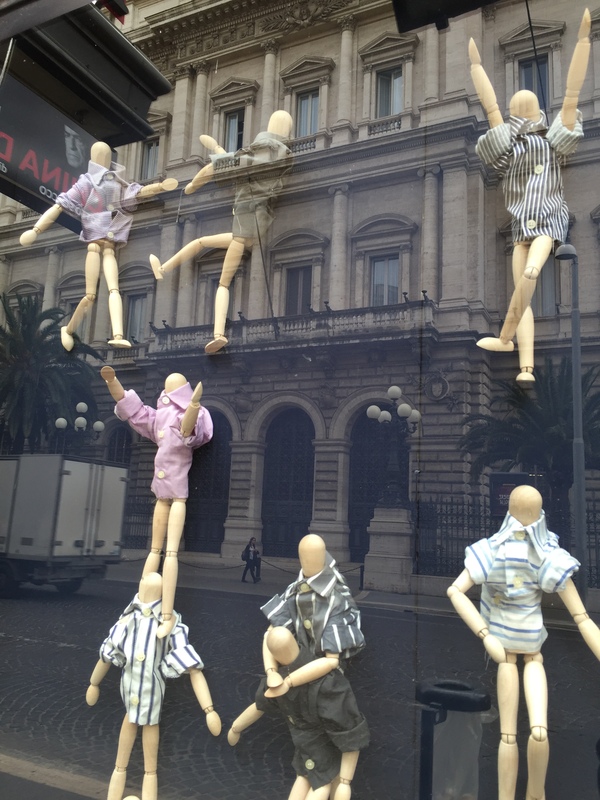 Address: (Via della Scala, 16, 50123 Firenze, Italy) and major cities in Italy. They have travelled to France, Spain, Belgium and England and a few locations in the United States. Whenever you get a label that reads “made in Italy” you immediately feel an element of understated elegance, refinement and quality. photo: Colleen Kohse. 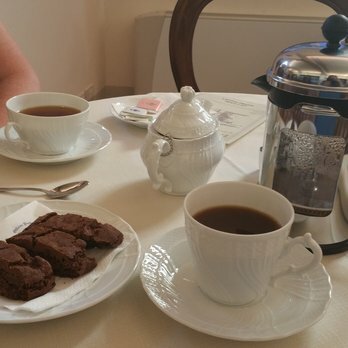 Colleen just visited their store location in *Capri, off the Amalfi Coast. She is killing me with her enviable photos. The clothing is usually a cut (excuse the pun) above the rest. Mostly you feel an attention to detail, design and fit. And I gravitate towards a cut that is simple and sensual. 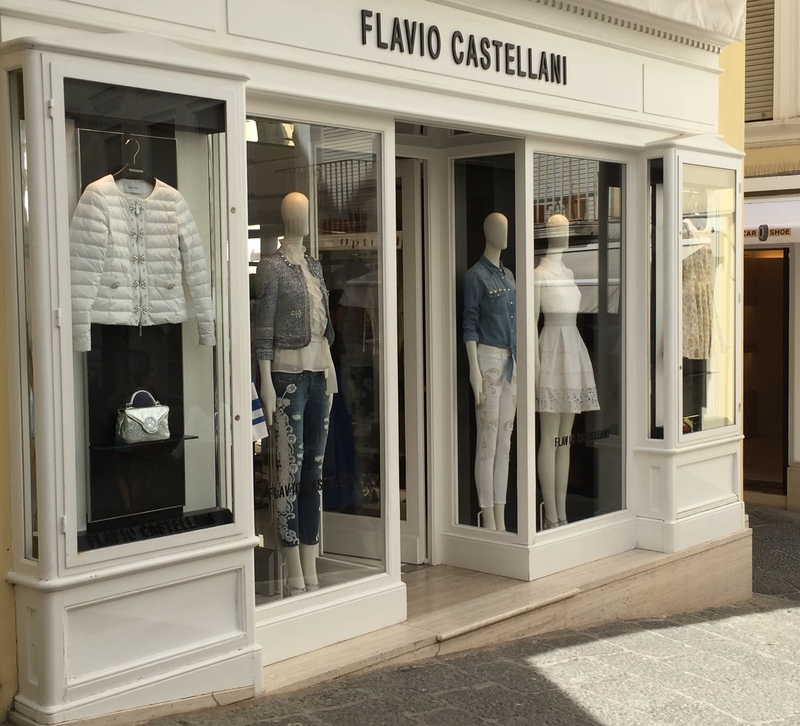 The Flavio Castellani label is a reflection of the “made in Italy” style of sophistication mixed with a fun look for the feminine and modern woman. The brand is the outcome of the combined creative spirit of fashion designer Rita Ricci and the management skills of Flavio Castellani. La moda e’ eleganza e raffinatezza. La moda e’ arte e questa e’ la mia passione. Fashion is elegance and refinement . One of my favourite kind of pants to wear once the weather starts to warm up is capris. Thanks to a designer by the name of Sonja de Lennart who invented *Capri pants in 1948. The pants’ name derives from the Italian isle of Capri, where they rose to popularity in the late 1950s and early ’60s. Grace Kelly was among the first movie stars to wear capris on the island. There have been many more since. Audrey Hepburn immediately comes to mind. 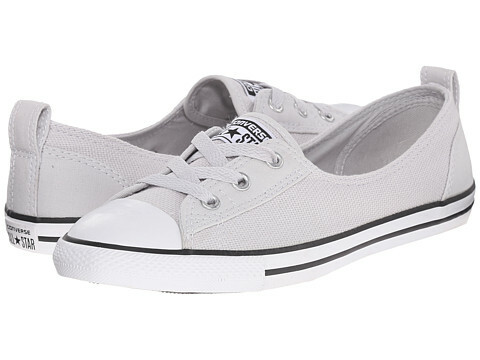 To me they are the perfect pant – comfy casual with flats and a Tee but can be dressed up with heels and a nice shirt. How about you? Do you believe the “made in Italy” label is more special?